Welcome to the Creative Health & Spirit Store. Our intent and purpose is to offer products & services that give you the tools to help you expand your mind, help heal your body and lift your spirit so you can be supported in your search for increased self-awareness and get insight into overcoming life's challenges while having FUN in Life's process. 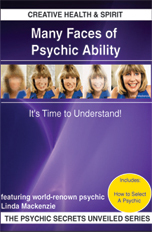 This educational and entertaining DVD pierces the veil of confusion surrounding psychic abilities by providing history, little-known facts and personal experiences to bring to Light the understanding of where psychic abilities come from, info on over 17 distinct and different abilities and their uses and more! 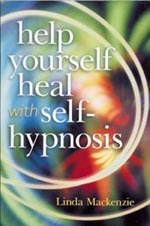 Winner of a 1998 "COVR Best Metaphysical Book"Award, this book is an incredible resource on health & awareness. 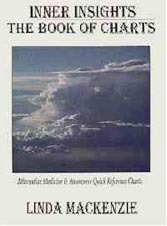 Get 1000's of general and little known facts in easy-to-read chart format on over 40 topics like: Acupressure, Angels, Herbs, Astrology, Aromatherapy, Auras, Bach Flowers, Runes, Native American, Chinese Elements, Herbs and Horoscope, Colors, Crystals, Gods, Goddesses, I Ching, Planets, Numerology, Palm Reading, Phrenology, Planets, Reflexology, Supplements, Western Elements & more - All In One Book! Aid self-healing using your mind. This world renown guidebook teaches you how. Help yourself relieve symptoms and heal from over 40 illnesses and negative emotions. Learn to supplement your healing sessions with hints on diet, herbs, supplements, aromatherapy for each topic. YOUR COST: OUT OF STOCK! For ANYONE who wants to write or has written a book and desires to self-publish, market, distribute and sell the book successfully. It helps maximize your success and minimize your effort. All steps and methods of action are provided in a concise, understandable format with a resource list of industry contacts. This educational and entertaining Audio CD pierces the veil of confusion surrounding psychic abilities by providing history, little-known facts and personal experiences to bring to Light the understanding of where psychic abilities come from, info on over 17 distinct and different abilities and their uses and more! Help make menopause a positive experience. Informative, educational and an easy-to-use aid to reduce menopause symptoms. Get the facts and explore healing therapies on cultural differences, symptoms, HRT, NRT, diet, herbs, exercise, vitamins, supplements, visualization and aromatherapy. 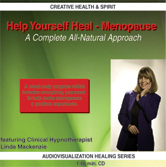 Plus you get 7 healing visualizations for each menopause symptoms! Winner of a 1999 COVR"Best Spoken Word Audio" Award. Get the missing link to weight loss! In less than 20 minutes a day you can help: alter your emotional ties to eating, reduce food intake, change eating habits and get motivated to enjoy exercise! Now you can get your own personal trainer for your mind to help yourself think thin, release stress AND lose weight! 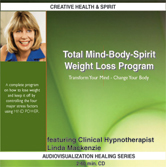 This program is used nationwide by doctors, clinics and health practitioners for their patients. Linda Mackenzie's GET ON RADIO! IF YOU WANT TO GET A RADIO INTERVIEW THIS CD IS FOR YOU! 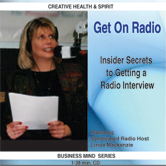 Linda shares her insider secrets through entertaining stories & info on how to get a radio interview. This CD helps you discover where to look for radio shows, how to pitch an idea, what to do before, during and after the interview and when to advertise and when to interview to produce results. PROMOTE & MARKET YOUR WEB RADIO SHOW! IF YOU WANT TO GROW YOUR AUDIENCE THIS CD IS FOR YOU! It is important to actively promote your online radio show so your audience can be constantly increased. 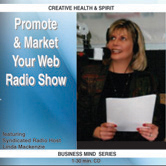 This informative CD shows you how to promote and market your internet Radio Show. You'll discover: How to promote & market on the web; How to get, keep & increase a loyal audence; Effective print advertising; What to do on your show, How to get publicity and more. 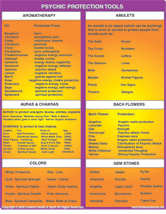 On this colorful and informative double-sided chart you will get 12 different categories of psychic protection tools including: aromatherapy, amulets, auras/chakras, bach flowers, colors, gemstones, prayer/intention, protection herbs, symbols/shapes. trees, visualization and vowel sounds. Get helpful "how-to" essays, hypnosis scripts and other helpful word document files downloaded to your computer. Just order, pay through paypal, provide your your email address and the files requested will be sent to you. 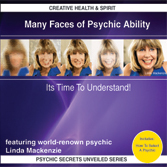 Get a FREE On-Air Reading on "Linda Mackenzie Radio Show." Tuesdays, 8:30-9:00 a.m. PT. Call 800-555-545, 310-371-5444.